This is the most awesome thing I have ever seen. I think Boston–or maybe Somerville–needs a league. 2009 market share numbers show iPhone at 14% of all mobile phones (not just smartphones), behind RIM but ahead of Windows Mobile. Grab bag: IE6 going down? Videos will continue to work? “Deprecated” ain’t what it used to be. The actual IE6 funeral party. With both Google and SalesForce announcing that IE6 will be de-supported, the end of a long nasty nightmare is in sight. Author Tim's BookmarksPosted on February 23, 2010 Categories linkblogLeave a comment on Grab bag: IE6 going down? Some new features on the Virginia Glee Club wiki. Pages have been added for selected Glee Club seasons which list the concerts, tours, and other events known for that season, and include information about the conductor and officers of the group, where available. The most fun part of this section of the wiki has been the old concert programs. The administrator of the Virginia Glee Club has scanned quite a few concert programs, including the one from the premiere of the Testament of Freedom, and I was inspired to do the same, starting with programs and posters from the 1993-1994 season (that’s the group photo from the spring of 1994 above, as used on the poster for the Tour of the Northeast). As always, contributions of information from other alumni are welcome as we build this record of the Glee Club’s history together. 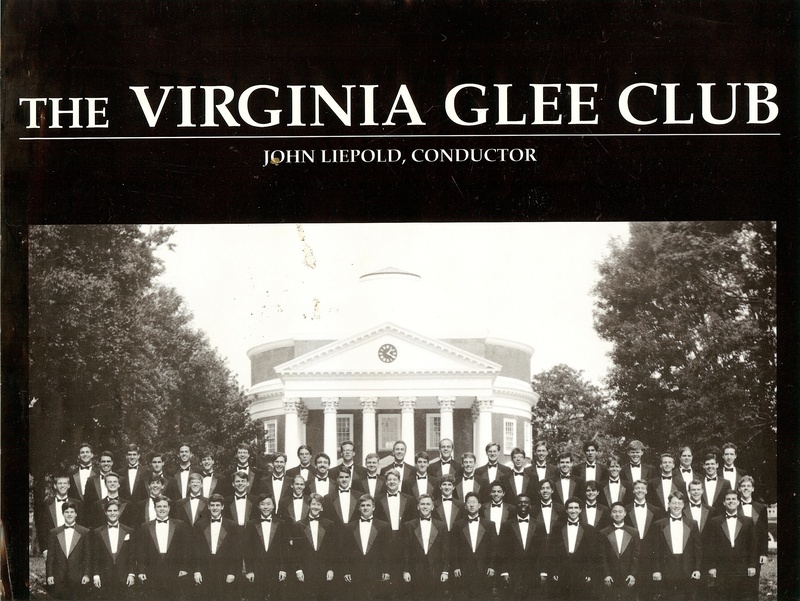 I have quite a few updates to post about the progress of the history of the Virginia Glee Club on the wiki, but today’s item deserved a jump to the head of the line: the resurfacing of a lost recording of the 1993 Virginia Glee Club singing our commissioned work to commemorate Thomas Jefferson’s 250th birthday, Young T.J.
And Judith Shatin wrote a setting of the Declaration of Independence that proved what the Testament of Freedom had hinted: setting Jefferson’s writing to music was full of pitfalls. 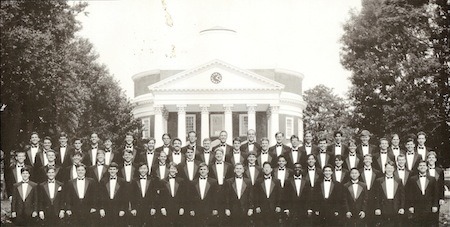 The Glee Club had begun commissioning new works for men’s voices in the 1991-1992 season, and for Jefferson’s birthday we wanted something special. So our fearless director John Liepold reached out to his old professor and mentor Neely Bruce for a Jefferson-inspired composition. They decided that, since the Glee Club had already gone down the Jefferson words path with Testament, the smart thing was to choose texts that inspired Jefferson instead. Bruce selected ten texts from Jefferson’s Commonplace Book and set them to music that Jefferson might have heard in his youth, songs heavily inspired by the Sacred Harp and other shape note music. The result was Young T.J., a group of short settings that try to imagine what influenced the young Jefferson. The Glee Club performed the whole work a few times that year, notably at our spring concert, and used a short set of the works on a number of occasions, mostly notably during our trifecta of performances on April 13, 1993. We began the morning at Monticello, shivering in the pre-dawn light on risers, and using Young T.J. to provide music for the commercial cutaways during the broadcast. I also remember standing at a urinal under Monticello next to Willard Scott, and of course Katie posing for pictures with Tyler Magill, Paul Stancil, Scott Norris, Denis McNamara, and Mitch Harris (above). We also performed portions of the work at the Jefferson Memorial for Bill Clinton and a capacity crowd (after a frantic drive from Monticello to DC at top speed followed by a sprint across the grass to get to the stage on time). A final performance at the Jefferson Hotel in Richmond that night was the capper. So, the lost recording. This page, linked from Neely Bruce’s publisher’s site, has a full set of recordings of all ten movements. When exactly they were recorded is subject to dispute–the page claims they were recorded at Monticello on April 13, 1993, but there’s no background noise and we didn’t have time to run and record everything that day, I don’t think. But they are unmistakably a document of the 1992-1993 Glee Club under John Liepold’s direction. And since none of Liepold’s recordings have ever been transferred to digital release (only three tapes, the 1991 Christmas Concert, a concert at River Road Baptist Church, and the Dove in the Hall recording surfaced from his time with the group through the summer of 1994), this is a nice present to have, even if it’s not available for download. Don’t call your users idiots.You’re not doing yourself any favors. Glad Comcast is spending its money so effectively. Root certificate vulnerabilities to attack the phone. Buried in the Outlook Shortcuts > For All Items list (hidden away behind disclosure triangles) is a most useful Inbox Zero tip: Use CTRL+SHIFT+V to move one or more selected mail items. If like me you only have one mailbox to which you move items once you’ve tagged them (my archive), the popup that comes up always has the right mailbox selected, so the workflow is CTRL+SHIFT+V, then Enter. My mouse was getting in the way of fast email processing and this is a good alternative. Interesting tips for making a headless Mac headful. Incredible miniature photography and models. Dave writes about use of your Google Profile information to personalize search results. To which I reply, Yes, and what took so long? Okay. So you’re the world’s biggest book merchant, and you completely pull physical and digital inventory of a publisher’s books out of circulation because you have a pricing disagreement with them. I mean, they’re totally gone from your website. Then you reinstate them after reconsidering your position. Would you choose to use the word “monopoly” in your post explaining the situation? Would you, seriously, use the word ABOUT THE PUBLISHER? What on earth are they smoking at Amazon? There’s something refreshing about the thought that there is no longer any point to trying to get the “world’s tallest skyscraper” title. Maybe now we can refocus attention on the streets. “Millions of ads use Flash. Get used to the blue legos. You’re welcome.” <—Hahaha. Do you really need Flash for the Web? on Flickr – Photo Sharing! A more cogent take on the Flash evangelist’s “blue Legos” picture, using actual Mobile Safari screen caps. Only two sites are completely inaccessible without Flash. “The Republicans are better at questioning the President than you are.” Does an “articulate president” who engages in “substantive” discourse spell doom for the media? Maybe for the media we have now.